The card base is made from Crumb Cake Cardstock with a layer of Very Vanilla cardstock. 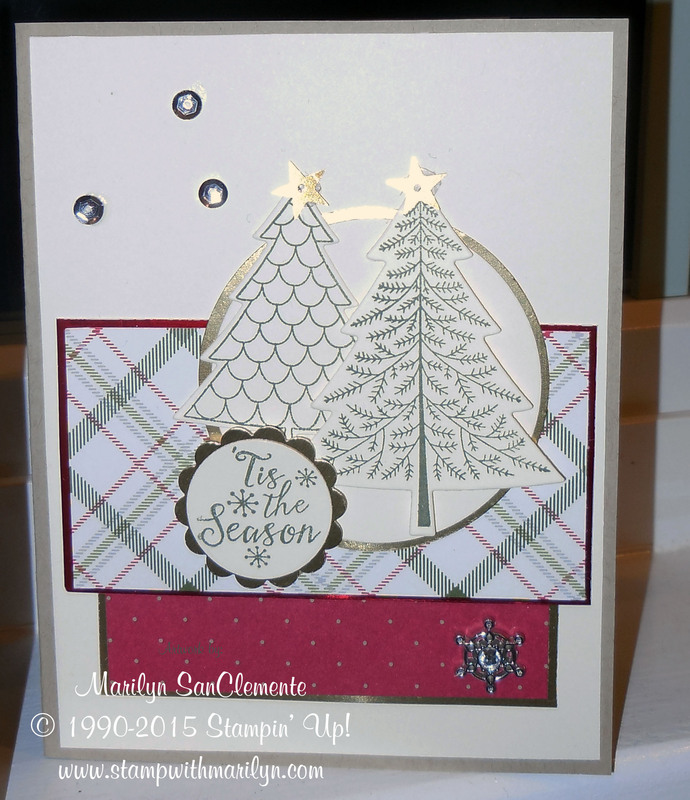 The designer paper is the Merry Moments Designer paper from the Stampin’ Up! Annual Catalog. The Cherry Cobbler designer paper is layered with a piece of Gold Foil and the plaid designer paper is layered with a piece of Red Foil. I do love the way that the layers of foil offset the designer paper! The pine trees are stamped with Always Artichoke ink and cut out with the thinlits. The trees are layered onto a circle of Very Vanilla Cardstock which is layered onto a circle of Gold Foil. The message “Tis the Season” is also stamped with Always Artichoke ink and layered onto a scallop punched with the 3/4″ scallop circle punch. And of course you cannot forget the bling! I used gold sequins for the tops of the Christmas trees. Here is a list of the supplies used to make this card.